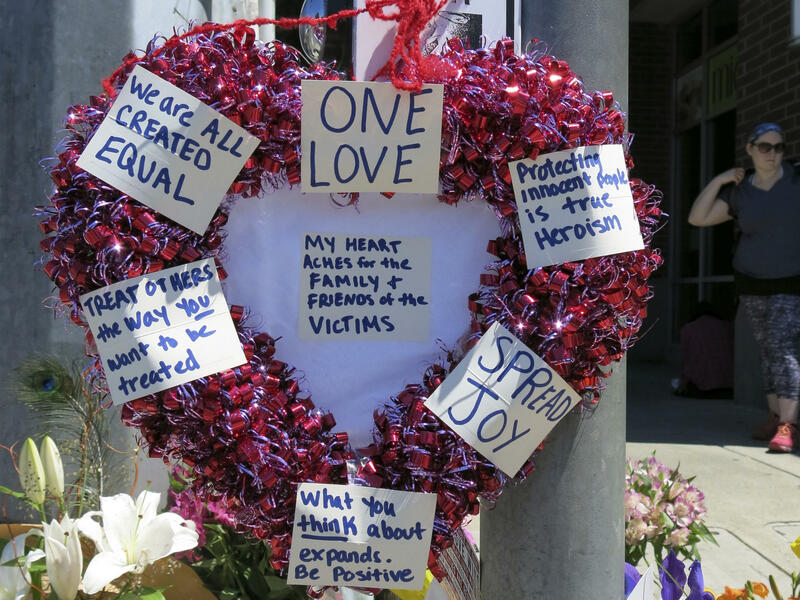 A heart-shaped wreath covered with positive messages hangs on a traffic light pole Saturday at a memorial for two bystanders who were stabbed to death Friday on a light-rail train in Portland, Ore.
Portland police have charged Jeremy Joseph Christian with two counts of murder and one count of attempted murder. Two people are dead and one was injured after a stabbing on a train in Portland, Ore., on Friday afternoon. The suspect stabbed three men before fleeing the train; police located him and took him into custody. On Saturday afternoon, police identified the two men killed as Ricky John Best, age 53, who died at the scene; and Taliesin Myrddin Namkai Meche, 23, who died at the hospital. A third man, 21-year-old Micah David-Cole Fletcher, is injured but expected to survive. Taliesin Myrddin Namkai Meche, My dear baby boy passed on yesterday while protecting two young Muslim girls from a racist man on the train in Portland. He was a hero and will remain a hero on the other side of the veil. Shining bright star I love you forever. Police identified the suspect as 35-year-old Jeremy Joseph Christian of North Portland. He has been booked on two counts each of aggravated murder and intimidation in the second degree, and one count each of attempted murder and being a felon in possession of a restricted weapon. Oregon Public Broadcasting reported that Simpson said that, though the attack happened just before the start of Ramadan, police weren't yet sure the attack was "religiously motivated." "According to some preliminary witness statements, he was kind of spewing hate about a lot of different things," said Simpson. "So not specifically and exclusively anti-Muslim. ... So that's why it's hard to say at this point was he directing it at any one person, or was it just kind of in general to everyone around him." "We don't know if he's got mental health issues, we don't know if he's under the influence of drugs or alcohol, or all of the above," said Simpson. "Right now we're in the very early stages of the investigation." Imtiaz Khan, president of the Islamic Center of Portland, told OPB that since the election, hate speech and harassment of the Muslim community have increased. "We are very sad. Ramadan started just a couple hours ago," said Khan. "We are very sorry for the two men who tried to do the right thing." Khan said that "of course people from the Muslim community are concerned. And unfortunately the easy targets are women because of the headscarf." Police say they have identified and been in contact with the two women, whose identities were not released. 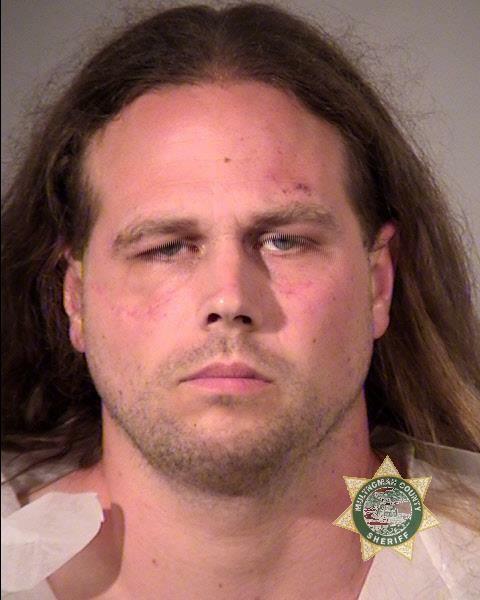 The Portland Mercury reports that the suspect was a "known local white supremacist." The alternative weekly published photos and video of Christian at a "March for Free Speech" on April 29, to which he brought a baseball bat. Draped in an American flag, he yelled "I'm a nihilist," and shouted profanity and racial slurs. The Southern Poverty Law Center reviewed Christian's Facebook page, and found numerous posts espousing extremist views. In a post from April 19, Christian praised the Oklahoma City bomber, writing, "May all the Gods Bless Timothy McVeigh a TRUE PATRIOT!!!" In a February 2016 post, he wrote: "I'm sure most of you don't remember but the American Nazi Party was taking care of a stretch of highway in Oregon about 10 years ago until ODOT took down their sign. Apparently Nazis don't have the freedom to exercise their civic duties in this State. Why? Because we live in a Fascist Police State run By 'Liberal' 'Multicultural' NAZIS!!!" In a statement released Saturday, police say they will "extensively examine" Christian's background, "including the information publicly available about the suspect's extremist ideology" in their investigation. Christian wasn't flagged as a gang member, "nor does he have any known mental health history listed," the department said. Court records show that Christian was convicted in 2002 of robbery, kidnapping and a weapons charge, according to the AP. Police say the state medical examiner was conducting autopsies on the victims on Saturday. Christian will be arraigned on Tuesday and could face additional charges.